How Long Does It Really Take to Get Off a Cruise Ship? Cruisers are a funny bunch. Come time to board a cruise, everyone is excited to get on the ship. Many people get there early and wait for hours before boarding even begins. But as soon as a ship comes to port or returns back home, everyone can’t wait to get off. So, exactly how long does it take to get off the cruise ship? 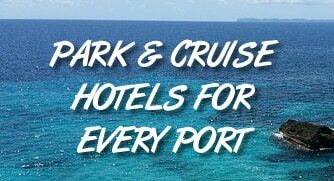 Well, it depends on if you are visiting a foreign port or returning back home at the end of a cruise. If you’re visiting a port on your cruise — like the Bahamas or Cozumel — then it doesn’t take very long to get off the ship at all. In fact, the cruise lines let you go as soon as the ship is docked, secured, and the local authorities give the go-ahead. There is a bit of a rush at the beginning of the “let out,” but it usually goes very quickly. Since all of the immigration paperwork is taken care of by the cruise line beforehand, there is no real hold-up in getting off the ship (like there would be if you were arriving via plane and had to go through immigration). You will simply swipe your cruise ID card (which is also your room key) at a kiosk at the exit of the ship that lets the staff know you are off the ship. Then you just walk on shore via the gangway. If you line up early to get off the ship before it is docked, you might have to wait a little while the local authorities clear the ship for disembarkation. If you want to limit your wait to zero, just find something to do for about 30 minutes after docking before leaving the ship. By then any line whatsoever should be cleared. Unfortunately, the process for disembarkation doesn’t go as fast once you are back at home. Part of the reason is other passengers and another part is the immigration process. To make things “try” to run smoothly, the cruise lines usually unload passengers by sections. For example, Royal Caribbean gives you numbered luggage tags and a schedule for when your numbered group is to deboard. You attach the tags to your luggage and set it outside your cabin door the night before arriving home. The staff then takes your bags so you don’t have to carry them. Then when you number is called the next morning, you leave the ship and pick up your bags onshore. But the cruise lines allows passengers who are carrying all their bags with them to disembark first. Since using the luggage tag system could mean waiting hours before its your turn to leave the ship, most people opt to just carry all their bags and leave early. This leads to enormous, slow lines with hundreds of passengers trying to carry all their heavy luggage. Meanwhile, every passenger also has to go through immigration and customs. In our experience, disembarking with the first call of passengers, waiting in line to leave the ship, and then clearing customs took about 1.5 hours. Instead, when it comes time to leave we recommend enjoying your last few hours on the cruise, having a bite of breakfast and waiting until the masses leave the ship. It will make your disembarkment go much faster and you won’t have to stand in lines.